Combined with state-of-the-art technology, WATO EX-65/55 provides comprehensive patient safety guarantee, advanced ventilation solution and unprecedented ergonomical design for clinical use. Integrated with world class ventilator and innovative gas measurement technology, WATO EX-65/55 could provide down to 20ml tidal volume and up to 7 different ventilation modes including Manual, Spont, VCV, PCV, SIMV,PSV and PCV-VG. With such ICU quality ventilation and electronic gas flowmeter technology, WATO EX-65/55 is suitable for all kinds of patient ranging from neonate to adult. By the help of heated module, WATO EX-65/55 significantly reduces the water condensation inside the breathing circuit, especially during low-flow anesthesia, which will extend anesthesia machine service time and reduce maintenance frequency. CO2 canister bypass function is another feature which could assure the patient keeping ventilation while anesthesiologist reloading the fresh sodalime. WATO Ex-65/55 features unparallel operation advantage for clinical use. 12/10 inches TFT touch screen improve the operation efficiency. Modular design accommodate advanced monitor module like BIS, AG and EtCO2 from Beneview series patient monitor and makes hardware upgrading very easily after sale. Integrated maintenance guide on the screen provide intuitive guideline for end-users. 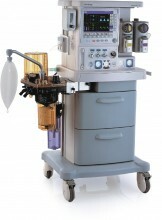 Click the button below to add the Mindray WATO EX-65/55 Anesthesia Machine to your wish list.